National wheel loaders are transisting from low lever low quanlity low price and founction meet requirements to high tech lever high quanlity middle price economic, from generic imitation to self-development, major manufacturers ongoing technical input, using different technology, technology innovation in critical components and systems, get rid of similar product design, the status of without its own characteristics and advantages, emerge from the cycle of low levels of competition, become pioneer of loader industry. 1. Large and small wheel loaders,in the development process during recent years, limited by the conditions objectively and total market demand. 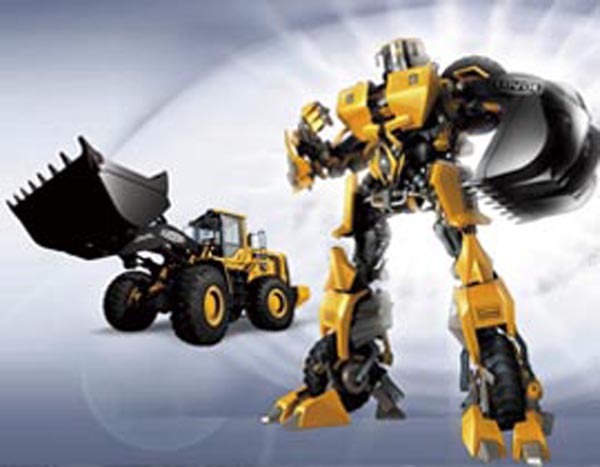 Most competitive mid-size loader will updated faster and faster. 2. In accordance with the actual situation of the manufacturers ，back to the overall design, optimize performance, enhanced strength and rigidity of the structure, so that reliability will be improved a big lever. 3. Refined architecture. Power system damping ,cooling system optimization,working device structural optimization, performance indicators and pivot dust, industrial design, etc. 4. Adopting electronic technology and load sensing technology to achieve automatic shift transmissions and hydraulic systems,improve efficiency, saving energy, reducing the loader’s job cost. 5. Improve safety, comfort. CAB step by step with capble of FOPS&ROPS function, driving indoor environment will move closer to the cars, steering wheel, seat, all handle can be adjusted so that operator is in the best position to work. 6. Reduce noise and exhaust emissions, strengthen environmental indicators. With the increasing people’s awareness of environmental protection, emission and noise reduction of loader’s work has been brought to the imminent, many large cities have developed a motor vehicle noise and emissions standards, construction machinery which do not meet emissions standards will limit sales in the region. 7. Extensive use of new materials, new processes and new technologies, particularly mechanical, electrical and hydraulic integration technology, improve product longevity and reliability. 8. Maximum simplification of maintenance to minimize the frequency of maintenance and repair time, increases maintenance space, commonly used by electronic surveillance and monitoring techniques, further improvements in fault diagnosis system, provide drivers to troubleshoot the problem method.